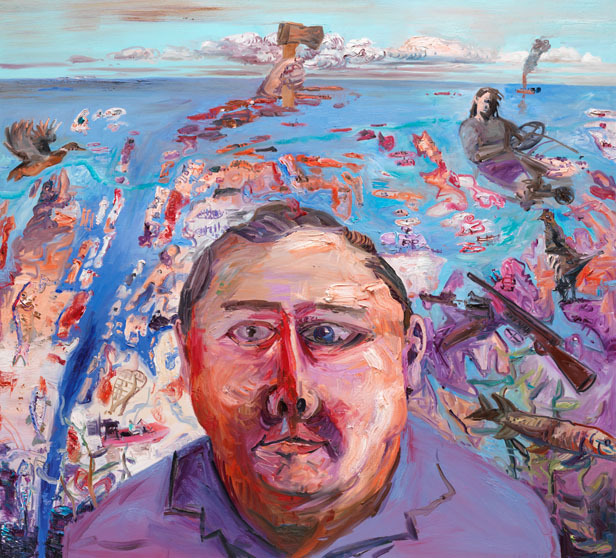 The portrait of Andy Trudeau occupies much of the space of this painting. His outsized persona was a huge part of this landscape in the years he owned Manitou Marina. The portrait was based on a sketch I made of Andy in 1974 when I lived with him and Pat Trudeau for the winter months. This was my first studio and Andy was my teacher on the art of living on Georgian Bay. His family had homesteaded in Spider Bay in the thirties and now he and two of his brothers and one nephew lived and worked in the area depicted in this painting, from Odonnel Point in the south to Sans Souci in the north. We closed up summer cottages, trapped beaver and fox, hunted ducks and deer, repaired scoots and boats, netted fish, and partied deep into the winter.